2 and 3-star hotels at discount prices in Hungary and Budapest. Cheap hotels located in the heart of Budapest. Accomodation on the Buda side with discount prices and good public transport connection. 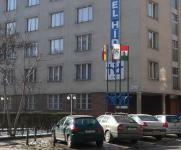 The cheap hotels in Budapest offer high-level accommodation at cheap prices. 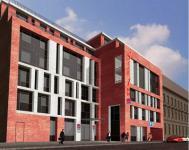 You can find cheap accommodation in the centre of Budapest with online booking on our website. They satisfy all of your needs. Spend your holiday in Budapest! The Hotel Anna Budapest is located in a quite environment, near to the metro stop in the XI. district. waiting for its guests. The building has 37 double rooms with unique equipments, 11 exclusive single rooms and one apartment. Mimama Konyhája is a family restaurant next to the hotel, which makes Hungarian cuisine for the guests. low-priced renovated Hotel in the district X. Hotel Pest Inn *** superior is situated in Budapest, only a few kilometers away from the Liszt Ferenc International Airport of Budapest. The hotel awaits its guests with 78 standard rooms, own restaurant and event room. Thanks to its location, near the Üllői road and the underground station, the renovated Pest Inn Hotel is a perfect accommodation solution for both businessmen and tourists. Hotel Sunshine is one of the newest hotels of Budapest, opened in June 2012. The hotel is equipped with the modernest technology, contributing with this to the high-level service and to the comfortness of the guests. Hotel Sunshine awaits its guests with 20 non smoking rooms, a Finnish sauna and a jacuzzi in the vicinity of the International Airport of Budapest. 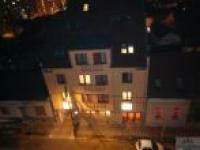 Comfort Apartments at discount prices in the centre of Budapest. 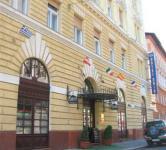 Hotel Atlantic at discount prices in the centre of Budapest. 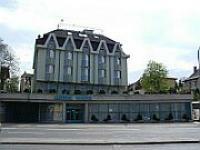 Hotel Thomas Budapest at low prices. Alfa Art Hotel in Budapest at affordable price. Hotel Walzer is located on the Buda side of Budapest, in green and quiet surroundings but even close to the city center. The 3-star renovated hotel offers its guests single, double and triple rooms in a building outside like a country mansion. For a complete relaxation experience sauna, fitness room and massages are at guests’ disposal. 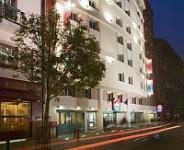 The 3-starIbis Styles Budapest City is situated on the Pest side of Budapest, close to the city centre. Non-smoking rooms and rooms with panoramic view to the river Danube are awaiting the guests. The 3-star Ibis Budapest Citysouth*** is situated in one of the growing business districts of Budapest. This is the nearest hotel to the airport, with free and pay-parking with security guard. The own garden guarantees a pleasant atmosphere throughout the year. The Jagello Business Hotel is located on the Buda side of Budapest, in the vicinity of the downtown with excellent public transport facilities. The 3-star hotel is a highly recommended place for traveling businessmen: direct dial telephone, free Internet access, fax, etc. are available for the guests. The most important sights and the business centre of Budapest can be reached in 15-20 minutes from the hotel. Hotel Ibis Budapest City is a brand new 3-star city hotel in Budapest, close to the tourist attractions and the business and shopping centre. The four-star Hotel Budapest**** with its unique cylindrical-shaped architectural style offers the most beautiful panorama of Budapest. The hotel is ideal for conferences, corporate meetings or other special events. All rooms with air-conditioning! The totally renovated 3-star hotel ibis Budapest Heroes Square is situated at the green heart of Budapest, in the City Park, next to the world heritage Heroes Square. The four-star City Hotel Budapest offers 4-star services at 3-star prices.The apartment hotel is located in the heart of Budapest, in the commercial and business center of the city, in a quiet street. The 3-star Hotel Bara*** is a centrally located hotel in Budapest. The hotel has a good public transport connection, online room reservation, and discounted prices. Hotel Griff - 3 star hotel with 108 rooms in pleasant environment on the Buda side of the capital, with easy access to all tourist attractions. Ideal for groups and individual travellers. Green Hotel 2003. The newly built 3-star Star Inn Hotel Budapest Centrum is located right in the heart of Budapest, in the commercial, shopping and cultural centre of the city, so it is an ideal place for both tourists and businessmen. 125 soundproof rooms, 5 non smoking floors and a deep garage are available for the guests. Paid parking is available, in the hotel’s deep garage. 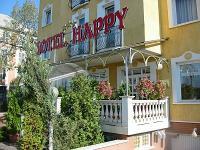 Hotel Nap *** is located near the airport of Budapest. The modern city hotel can be easily reached by public transport from the downtown. The hotel awaits its guests with online room reservation, and cheap price. Three-star Hotel Omnibusz is located near the biggest park (Nepliget) of Budapest, only 10-15 minutes driving from Budapest Airport and 5 subway stations from the centre of Budapest. All rooms of Hotel Omnibusz are air-conditioned and have Internet access (WIFI). The hotel has own, closed parking places. Hotel Mediterran is a modern 4-star hotel in Budapest, in the heart of Buda, at the foot of Gellert Hill, near the downtown. Special offers and packages for tourists, hoteltelnet offers hotels, with online hotel reservation. SPECIAL OFFER! free night : 7=6!The 3-star Hotel Polus *** is situated at about 8 kms from the centre of Budapest and 300 metres from highway M3. 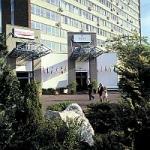 Hotel Polus *** is constructed directly next to Polus Shopping Centre, which provides a wide range of possibilities for purchasing, amusement as well as sports. The hotel offers air conditioned rooms of different types and apartments. There is a swimming pool at the reception level and a bowling centre with 4 lanes on the 6th floor. 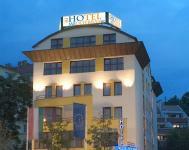 Hotel Seni*** located between the airport and the city centre. Cheap rooms, and online booking. The 3-star hotel Luna, built in 2001, is situated in Southern-Budapest, on the Buda side of Budapest. It’s a convenient point for both tourists and business people visiting Budapest. The hotel has a private car park and a conference room. Conference facilities serve up to 50 persons. 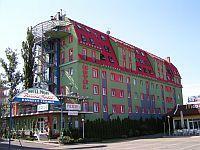 Hotel Zuglo *** is located in the green belt of Budapest. The hotel offers services at discounted price, and online booking. Pension Bibi is located in Budapest, in the centre of Buda side. Pension await the guests with online booking, and cheap prices. The three-star City Hotel Unio *** is located in the centre of Budapest, in the commercial and business district of the city. Many famous buildings and sights can be reached within 10-20 minutes from the hotel. City Hotel Unio offers comfortable, air-conditioned rooms exceeding the level of three-star hotels. The hotel's restaurant serves Hungarian and international dishes. Parking: in covered and guarded parking house 40 metres from the hotel. 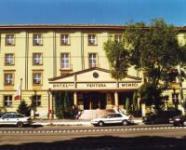 Hotel Ventura is situated in Budapest, on the Buda side, close to the city centre. Online booking with discounted price. Hotel Metro Budapest - Cheap three star hotel in the centre of Budapest, near to Westend City Center (western railway station). Hotel Happy Apartments *** is situated about 4 kms from the downtown in Budapest offers 20 different-sized apartments, online room reservation, and special discounts. 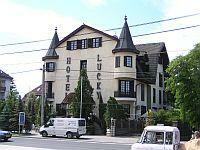 Hotel Lucky *** is situated in the green zone of Budapest in the vicinity of M3 highway. Online room reservation, cheap prices. 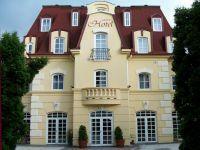 The 3-star hotel Gastland M0 is located at Szigetszentmiklos, along the M0 circular road, only 4 km from Budapest. Its proximity to Budapest and its exceptional accessibility make the hotel appropriate for holding business meetings and other events. 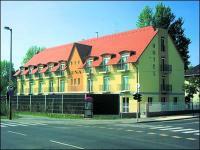 Hotel Gastland M0 offers 45 rooms with air conditioning and 4 hostel rooms at lower price. 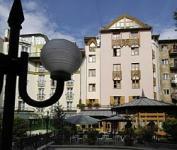 Besides the hotel restaurant, cafe, sauna and closed guarded parking await the guests. Drive Inn Hotel (former Etap Hotel) is located in the gateway of Budapest, right next to the M1 and M7 highways in Torokbalint. Drive Inn Hotel Budapest is a real budget hotel offering great accessibility, enormous parking lot and high quality but very cheap services. Discount hotel in Ujhartyan between Budapest and Kecskemet along M5 highway: Hotel Falukozpont Ujhartyan.